A while back, I reviewed Home to Chicory Lane by Deborah Raney. That book was a lot of fun, and kicked off the Chicory Inn series. When I had the opportunity to review Two Roads Home, the second book in the series, of course I wanted to learn more about what was happening for the Whitman family. What if it's too late for dreams to come true? Minor-but-nagging setbacks continue to sour Grant and Audrey Whitman's initiation into the world of innkeeping, but larger challenges brew when an innocent flirtation leads to big trouble for the Whitmans' son-in-law, Jesse. Jesse Pennington's friendly, outgoing personality has always served him well, especially in a career that has earned him and his wife Corinne a very comfortable lifestyle. But Corinne and Jesse are both restless---and for similar reasons, if only they could share those with each other. Instead, too many business trips and trumped-up charges of harassment from a disgruntled coworker threaten their marriage and possibly put their three precious daughters at risk. With their life in disarray, God is tugging at their hearts to pursue other dreams. 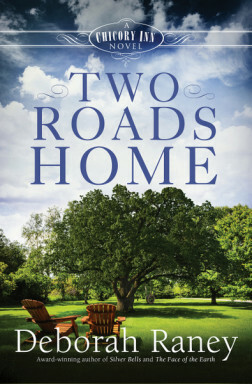 Can Corinne and Jesse pick up the pieces of what was once a wonderful life before it all crumbles beneath them? I think that what I enjoy the most about this series is following Grant and Audrey Whitman as they run a Bed & Breakfast Inn in their retirement, and to watch their relationships with their adult children. The first book focused on their youngest daughter, Landyn, and on their efforts to open the Chicory Inn. This book is focused on their oldest daughter, Corinne, but you do get to find out what is happening for the rest of the family too. Corinne is the daughter I ought to relate to. She's the oldest. She's a stay-at-home mom. She has more than the socially acceptable two kids. I didn't find myself relating to her all that well though. She mostly annoyed me in the first book, and I wasn't all that thrilled with her in this one either. Her husband earns good money, but he travels a lot. And her quest for a status symbol means they've bought a showpiece home that is enormous. She's hyper-concerned about looking the part, and I know full well that is a pretty normal thing these days. Buy more than you can truly afford, only purchase designer clothes, that sort of thing. When her husband's job is threatened, they both worry a whole lot about appearances, and I just wanted to slap them both and tell them to get a grip. That isn't exactly a ringing endorsement, is it? Well, despite the fact that Corrine and I would never walk in the same social circles, I did enjoy the book. I loved watching her parents, and although I believe they are a bit older than I am, they are the characters I relate to. How do you continue to love your grown-up kids when they are making choices you think are not so good? How do you set boundaries with them? Of course, Corrine grew up quite a bit during the course of the book too, and she was far more likable as the story closed. I think I'd get along with the end-of-the-book Corrine. I'm really looking forward to the next book, which focuses on Danae, the middle daughter.